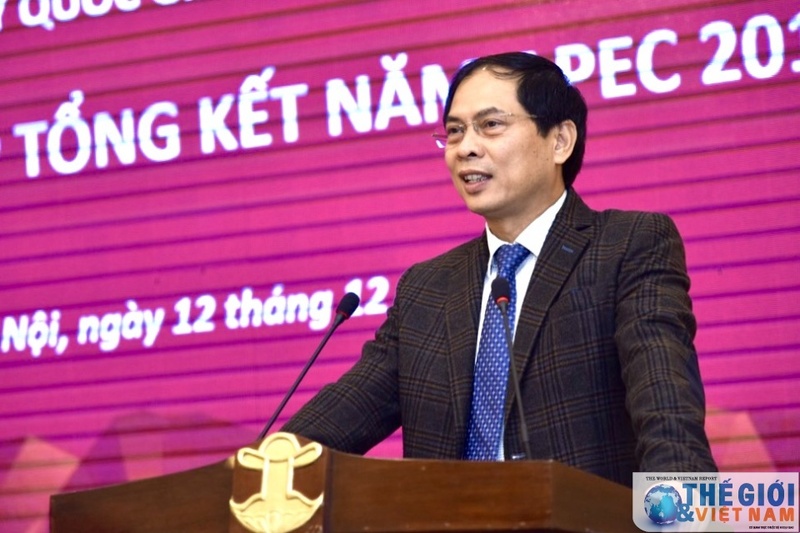 Permanent Deputy Foreign Minister Bui Thanh Son asked ministries and agencies to focus on realising outcomes reached during the APEC Economic Leaders’ Week at a review meeting of the APEC 2017 National Secretariat and the APEC 2017 National Committee’s sub-committee in charge of contents in Ha Noi on December 12. Deputy FM Son is Vice President of the APEC 2017 National Committee, and head of the APEC 2017 National Secretariat and the APEC 2017 National Committee’s sub-committee in charge of contents. He said ministries and agencies continue making contributions to policies of APEC, uphold the role of businesses in global economic integration and APEC cooperation in particular, contributing to enhancing the country’s multilateral external relations amid extensive global integration. Deputy FM Son lauded the APEC 2017 National Secretariat, the sub-committee in charge of contents, especially ministries chairing four priority fields and 8 ministerial conferences and meetings, working groups for raising high sense of responsibility to contribute to the success of the APEC Vietnam Year 2017. He also thanked scholars, researchers and businesses for their efforts in the process. Though the Asia-Pacific Economic Cooperation (APEC) Economic Leaders’ Week 2017 wrapped up in the central city of Da Nang a month ago, it has still left deep impression at home and abroad, he said. The event was graced by the presence of nearly 120 delegates from ministries, agencies, 5 permanent sub-committees of the APEC 2017 National Committee and those made outstanding contributions to the APEC Year Vietnam 2017. Deputy FM Son recalled that during a ceremony reviewing the APEC Year 2017 on November 27, President Tran Dai Quang affirmed that the APEC Economic Leaders’ Week was successful in every aspect. Over the past month, high-ranking leaders and the National Secretariat have received congratulations by leaders and officials of APEC economies and international friends. During the Informal Senior Officials’ Meeting (ISOM) recently held in Papua New Guinea, the participants highly valued and congratulated Vietnam on the comprehensive success of the APEC Economic Leaders’ Week and the APEC Vietnam Year 2017, he said. Reporting work this year, the APEC 2017 National Secretariat said it partnered with the sub-committee in charge of contents and other sub-committees, ministries, agencies and localities to successfully hold 243 APEC events in 10 cities and provinces nationwide. Member economies expressed their support for Vietnam’s proposed theme and priorities for APEC Year 2017, agenda and hallmark initiatives. The adoption of the Da Nang Declaration at the 25th APEC Economic Leaders’ Meeting, the Joint Statement of the 29th APEC Ministerial Meeting and six important documents, bilateral exchanges and talks have deepened ties with partners. Active and proactive involvement of the business community in almost APEC 2017 activities also made important contributions to the APEC Year 2017 and the APEC Economic Leaders’ Week. 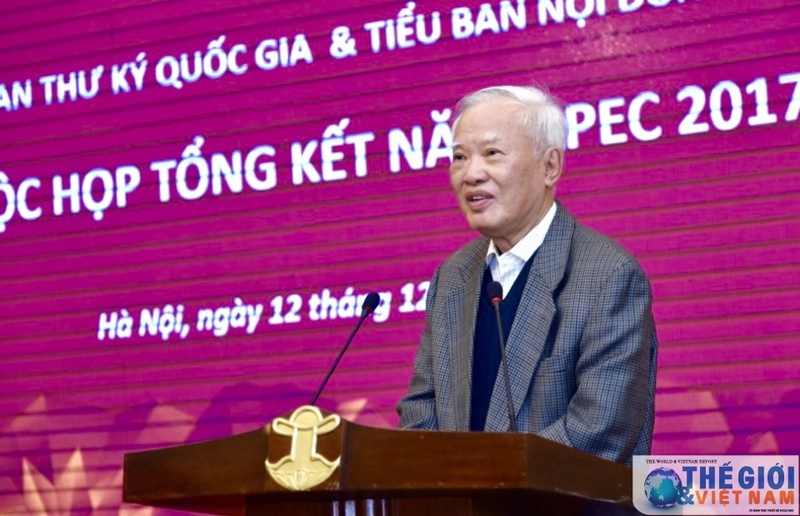 Speaking at the event, former Deputy Prime Minister and former Chairman of the APEC 2006 National Committee Vu Khoan called for effectively implementing commitments reached during the event and continuing to pushing forward initiatives proposed by Vietnam this year.